Earlier this week several site reported that Walt Disney World increased prices on their soft drinks at the counter service locations. Regular drinks have gone from $2.19 to $2.59 and large drinks have also seen a $.40 increase from $2.49 to $2.89. Recently Disney started testing RFID chips in "Grab-A-Mug" at Disney's All-Star Sports. It was a huge controversy when it was announced. However, with the 16% increase it's a better deal to pick up a refillable mug. 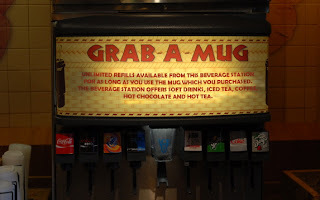 These might not be able to be used in the park but, if you spend one week at a Walt Disney World Resort and pick up one soft drink each day that comes to $17.43 plus tax. If you purchase a refillable mug for $13.99 plus tax you'll save more than $3. If you are like me and stop to grab a drink 2 to 3 times a day you'll save $36 to $54.